← Poor 4th Child… Introducing Baby Mikey!! For all one of you that may still visit this blog occasionally, we have big news! No, I am not pregnant, very funny! (You know you thought it!!!) We are however purchasing a RV and going to travel around the US, with potential for Canada and Mexico later. Q: How long are you going to do that for? A: 6 months. Maybe a year. Maybe forever. But probably just a year. Q: Are you crazy? Don’t you have 4 kids 6 & under? Q: I live in Florida/South Dakota/Ohio. Will you come visit me? A: Most likely if you want us to. Q: Can I come visit you? Q: What kind of RV do you have/are you getting? A: No idea. One that is reliable and sleeps 6 people and doesn’t require a CDL. 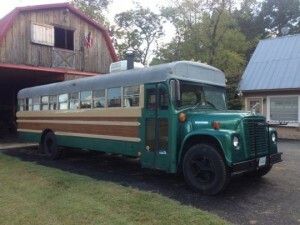 Q: Are you thinking about gutting a big bus and building the inside to your specifications? A: It’s like you read our minds!! We are weighing lots of options. A: Not sure yet. Intention to buy something in the next month or two, leaving between Novemberish and next spring. There are factors, people. Q: Can you show me a picture of a really sweet bus that was almost perfect but doesn’t have a shower that you have finally been convinced to not buy? Feel free to ask any other burning questions you have. More details as we have them. This entry was posted in RV Life. Bookmark the permalink. You guys ate so dang fun! Nice job. You are winning at life. But how will you quilt? I am the slowest replier. I am taking my machine. And as much fabric as I can stuff in all the compartments/sneak past Aaron!! I want you guys to come to Halifax! !